The overal aim of the association Résider pour entreprendre is to promote the development of entrepreneuriale activities by giving a residential welcome to wanna-be entrepreneurs wishing to create of take-over an econimic activity in Limousin. The association Résider pour Entreprendre propose the activity « logements passerelle » (“Stepping-Stone Housing”). This pilot activity offers the use of 3 houses and an area for collaborative co-working in the village of Meyirgnac L’Eglise. These “Stepping-Stone Houses” are aimed at temporarily housing (for a maximum period of 24 months) wanna-be entrepreneurs (and their family) who wish to start-up or take-over a business in the Limousin region. in possession of a professional project to start-up or take-over a business, and in the more advanced stages of the project, of which the development is strictly related to their personal project of living in a rural area. profoundly evaluating the coherance of their economic project with their rural and family lifestyle requirements. constant meetings with company directors and wannabe-entrepreneurs who live or who have lived through similar experiences. 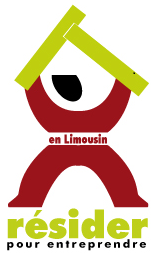 of those working within the economic and territorial development of the Limousin which offer accompaniment services adapted to the needs of the wannabe entrepreneurs as well as the individual territories within the region. Therefore, the overal aim of the project « Résider pour entreprendre » is to support the economic developement of the Limousin region, and more generally of the Massif Central, by promoting the creation and/or take-over of businesses, thus reenforcing the chances of success of longterm, definitive settlements in the region.